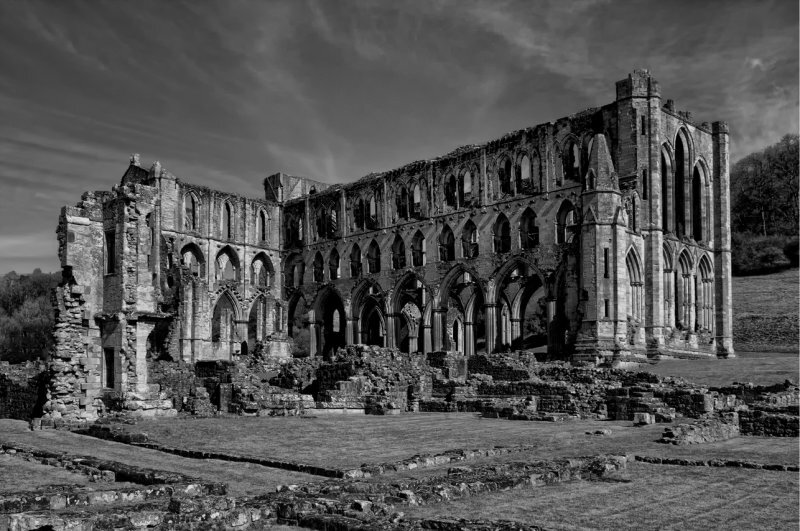 The magnificent ruins of the medieval monastry of Rievaulx Abbey sit in the secluded part of Rye Dale. The Abbey was founded in 1131. That is certianly on my list and this image justifies that all the more. v.
Marvellous composition of this eerie scene, so beautiful in B&W. Very well suited to black and white....very imposing structure... can imagine the beauty in its prime! It looks quite mysterious and spooky. Super shot. Super shot, Ann, and I really like that you straightened the verticals. Wow, awesome capture, Ann! Well done. What a majestic image! I love the black and white conversion, Ann. So well done! v.
Oh, wow, Ann! You have done it again. How beautiful! Very nice conversion - great tones! This is marvelous, Ann! Great job. Very well done and suited to black and white.